A taekwondo student typically wears a uniform (dobok 도복), often white but sometimes black (or other colors), with a belt tied around the waist. 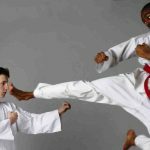 White uniforms are considered the traditional color and are encouraged for use at formal ceremonies such as belt tests and promotions. Colored uniforms are often reserved for special teams (such as demonstration teams or leadership teams) or higher-level instructors. There are at least two major styles of dobok, with the most obvious differences being in the style of jacket: (1) the cross-over front jacket (ITF style), (2) the V-neck or Y-neck jackets (no cross-over) typically worn by Kukkiwon/WTF practitioners. White uniforms in the Kukkiwon/WTF tradition will typically be white throughout the jacket (black along the collars for dan grades), while ITF-style uniforms are trimmed with a black border along the bottom of the jacket (for dan grades). The belt color and any insignia thereon indicate the student’s rank. Different clubs and schools use different color schemes for belts. In general, the darker the color, the higher the rank. Taekwondo is traditionally performed in bare feet, although martial arts training shoes may sometimes be worn. When sparring, padded equipment is worn. In the ITF tradition, typically only the hands and feet are padded. 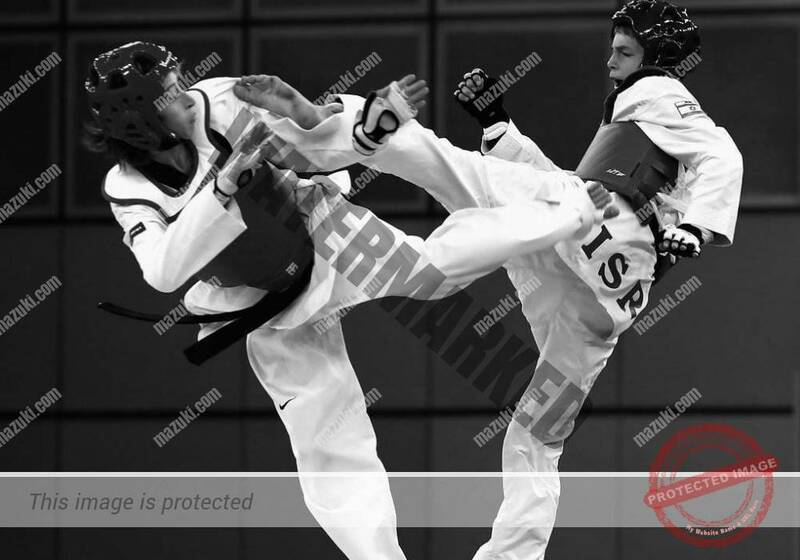 For this reason, ITF sparring often employs only light-contact sparring. 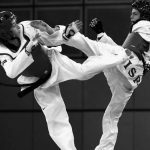 In the Kukkiwon/WTF tradition, full-contact sparring is facilitated by the employment of more extensive equipment: padded helmets called homyun are always worn, as are padded torso protectors called hogu; feet, shins, groins, hands, and forearms protectors are also worn. The school or place where instruction is given is called the dojang (도장). 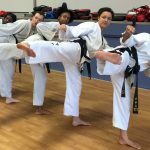 Specifically, the term dojang refers to the area within the school in which martial arts instruction takes place; the word dojang is sometimes translated as gymnasium. In common usage the term dojang is often used to refer to the school as a whole. Modern dojangs often incorporate padded flooring, often incorporating red-and-blue patterns in the flooring to reflect the colors of the taegeuk symbol. Some dojangs have wooden flooring instead. The dojang is usually decorated with items such as flags, banners, belts, instructional materials, and traditional Korean calligraphy.